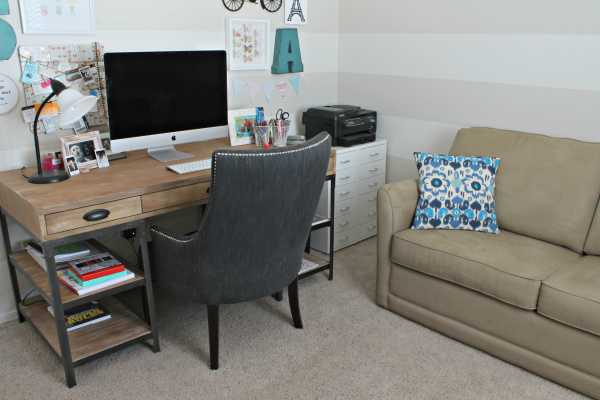 A few months ago I showed you the new desk that we bought for the office and rambled about switching up the layout of the room. 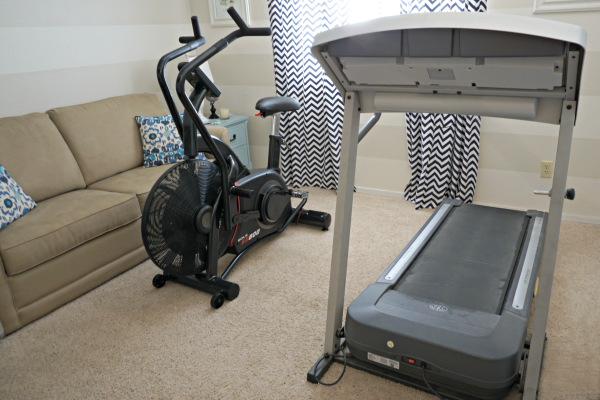 Well, we ended up REALLY changing the layout of the room because we decided to turn it into a home gym! Adam and I have been trying to exercise more, but we struggle to get to the actual gym. Adam’s original plan was to turn half of the garage into a fitness area. I’ll be honest, I didn’t want to turn our office into a workout area at first, so I went along with that plan. BUT, we live in Phoenix and the garage is like 1000 degrees in the summer, so I knew deep down that wouldn’t work. 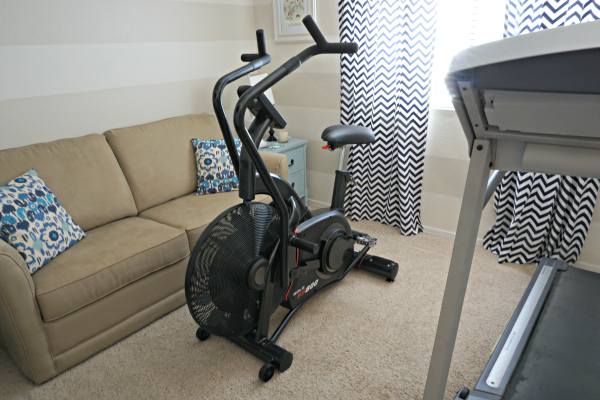 Eventually I realized that we needed to make this house work for our family, even if that means turning a pretty space into a room of exercise equipment. I feel stupid thinking about the amount of work (and extra money) we were going to put into the garage to make it usable in the summer just because I didn’t want to ugly up a room we hardly use. We use the desk area and computer, but not THAT much. The rest of the room is really only used when we have more company than can fit in the guest room, maybe 2 or 3 times a year. So, now the room is our new home gym. I’ve had the treadmill for years, but we just bought the exercise bike. It’s the SB800 bike from Sole Fitness and it was stupid expensive. BUT, we aren’t paying monthly gym fees anymore and it’s getting me to actually exercise, so I guess it was worth the money. We got rid of the small TV when we bought the new computer, so we moved the TV from the master bedroom in here. It’s a lot bigger than the old one, so it was a nice upgrade. We also bought a Roku stick for the TV so we can watch Netflix while we exercise. The stripes are staying, but I’ll probably change out most of the other decorations. We’ll probably get rid of the sleeper sofa and other furniture at some point. It would be nice to have more room for a small weight set or just more room to stretch out. By now you might be wondering about that new desk…well, it’s now in the guest room. 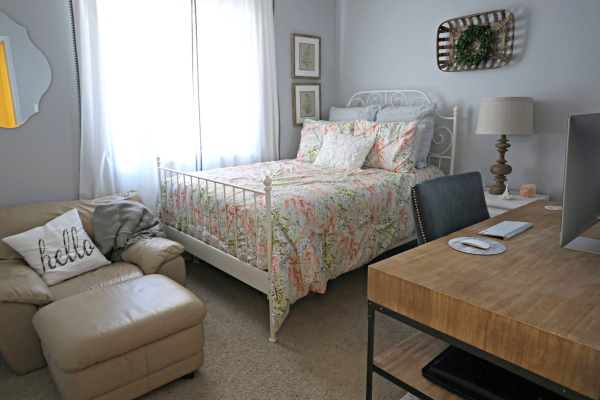 Remember the finished guest room from the Fall 2015 One Room Challenge? It’s now a guest room/office. We had to push the bed against the wall to fit the desk, which is not ideal, but it’s really the only way that everything fits. I need to re-hang some of the pictures and find a few new pieces to fit this layout, but I think it’ll all work out just fine. I’ll share more details about these rooms as we get everything rearranged and organized. Hopefully we’ll be able to call these rooms complete soon! Its good to make use of space that you have and make it more usable and practical. Your guest room looks lovely and the desk fits in fine. Love it. I always wanted a small home gym but I live in a small condo. I'll live vicariously through you for now. Hahaha! I also don't want to "ugly up" one of our rooms with exercise equipment! Maybe I need to just bite the bullet and make it happen! Exercise equipment can be such a pain. Ours was in the spare bedroom and now is in the garage after we joined a gym. It's great you have the space in the guest room for your desk. I currently live with a bunch of roommates but I can't wait for the day where I can have my own office / gym space at home! I actually just did the opposite. Rearranged my basement gym into an office area. Still have the treadmill because it folds up. If you're not makin use of your space, it's always good to change it up. I would love a home gym! I might turn the garage into that at some point.